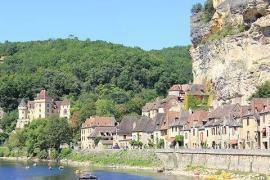 The Ceou Valley is a particularly peaceful part of the Dordogne with the exception of Castelnaud. 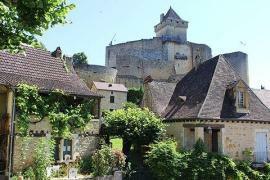 In the Dordogne area it runs from Gaumier in the South to Castelnaud la Chapelle in the north. 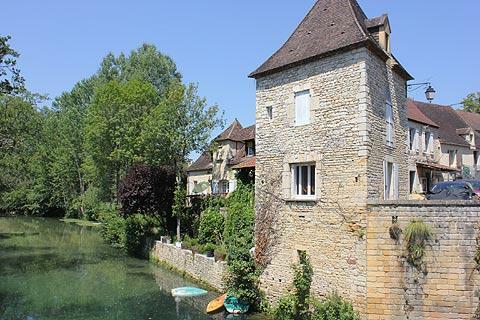 Along the way are a number of pleasant villages which have no particular sights but which are attractive and peaceful and make a change from the hussle and bustle of the Dordogne valley. Floriment and Gaumier in the south boast a wealth of houses built in Perigordine style with deep rooves, stone walls and wooden shutters. Surrounding the villages are many vines which have has a resurgence since 1990 and you can now do a walk around the vines and visit the cave to taste some of the local wines at the Chai de Moncalou. The wines are 'Pays de Domme' appellations and enjoy a good reputation. 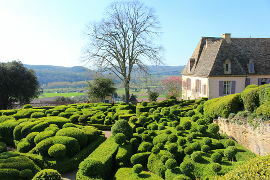 Above the chai is an excellent viewpoint over the surrounding Perigord countryside. Gardeners will want to visit the nearby Jardins de la Daille - a lovely 'English-style' garden and a visit includes afternoon tea. On the edge of the village in a large grassy area with two large wooden, open-sided halls. In the summer these become the venue for Bouzic's excellent night-time markets. Just turn up, grab a table and then wander round the stalls choosing your starter, main-couse and desert. Plates and cutlery are provided and other stalls sell bottles of wine (corked and plastic cups provided). These night markets are extremely popular and are a good, cheap way of eating out. The night market at Bouzic is every Tuesday evening in July and August. Bouzic itself winds gently uphill frome the river towards the church and along the way the streets are lined with beautiful Perigordine houses. Daglan is a lovely small town on the Ceou Valley and well worth a visit. As well as the attractive town you can visit the Maison de la Pierre Seche where you can learn about the tradition of building the small, round stone shelters of which there are many near Daglan. Every Thursday morning in July and August there is a guided 6km walk around some of the dry stone wall houses in the houses starting at 9am from the Maison de la Pierre Seche in the centre of town. 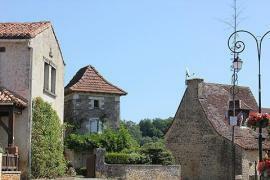 Daglan boasts a beautiful mairie with a round turret and a beautiful 14th century church. For more information see Daglan. 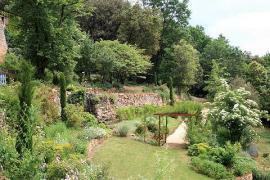 Saint Cybranet is a small hamlet which is home to some excellent gardens - the Jardins de l'Albarede, which show what can be done with poor, stony soil. 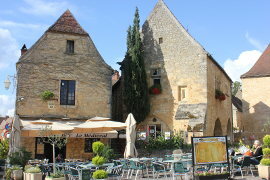 Castelnaud-la-Chapelle is both one of the most beautiful villages of France and home to the Chateau de Castelnaud, one of the Dordogne's most impressive and most visited castles. 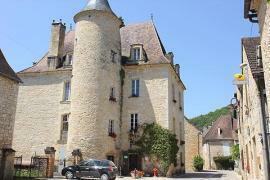 For more information see Castelnaud-la-Chapelle and the Chateau de Castelnaud. 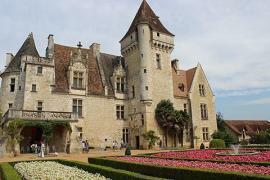 Close to the valley are also the towns of Saint-Laurent-La-Vallée and Saint Pompont (locally known as Saint Pompon). Saint-Laurent-La-Vallée is a tiny village set above the Ceou valley in a tranquil farming landscape. The centre of the village lies around its church which is well worth entering. In front of the altar the walls are covered in brightly coloured paintings - rare to see this in the Dordogne! Around the church the small square is surrounded by pretty houses and there is also an attractive water source. The houses are built in a creamy coloured stone and have deep perigordine roofs and some have attractive iron or wooden balconies. Saint Pompont is a lovely village with lots of attractive houses, a church and the remains of a 16th century castle. There is also the ancient stone gateway leading in to the village and a 13th century building that was once the hospital.